Her reason to move to another part of the world was...hilarious! But, that makes it possible for you to read her funny and insightful experience about adapting new life in different culture. New author of Getting Rooted in New Zealand novel, Jamie Baywood, not only talks a little bit of her new book that sold in Amazon.com, but also about her personal life before NZ, what's in the present and what else for the future. Above all, let's speak about culture with her! MRJ: So tell me how was your life before you decided to move to NZ? JB: It was always my dream to live abroad when I was growing up in California. I had bad dating experiences in California and read in a New Zealand tour book that the country’s population at 100,000 fewer men than women. I wanted to have some me time and an adventure. New Zealand seemed like a good place to do so. I know it sounds like a crazy reason, but I need a serious change in my life and felt I needed to leave the country to do so. I started dating my first boyfriend when we were fourteen and the relationship ended when I was twenty-three. I had never dumped someone and didn’t have the life skills to do so. Between ages twenty-three and twenty-six, I would only date guys I knew I could dump easily. Not surprisingly, only dating guys with clear and abundant flaws that were easy to dump, created a lot of chaos and drama in my life. When I was twenty-four, I had my second boyfriend who I call Hank, in real life his named rhymed with Hank. Hank had a drug dealer that sincerely went by the name Stank. I took Hank to rehab, after that I had a string of crazy suitors and ex’s. If you had Hank and Stank in your life, what other choice do you have, but to leave the country and become an author? MRJ: Tell me, what is the most interesting cultural experience that ever happened to you? MRJ: Which other country have you visited beside NZ? And which was harder to adapt? JB: Before I lived in New Zealand, I had only been abroad for a maximum of two weeks. I went to Europe, Costa Rica and Peru on short holidays. On route to New Zealand, I spent a month in American Samoa volunteering at a museum rehousing artifacts that were damaged in a tsunami. There is huge difference between traveling, or holidaying and internationally relocating. I was in New Zealand for over a year. I worked most of the time I was there, signed apartment leases, paid bills, went grocery shopping, etc. You usually don’t do those things on holiday. Although I intended to have a solo adventure I ended up meeting my husband a Scottish man in New Zealand. We’ve actually lived in two different countries in the United Kingdom after leaving New Zealand; Scotland and now England. After New Zealand, we moved to Scotland, got married in a castle and ended up living across the street from Edinburgh Castle in Edinburgh. Scotland is a sincerely magical place. There are so many castles in Scotland. Scotland has amazing architecture, beautiful mountains, lochs, beaches and sweet natured people. For unwanted and complicated reasons we had to move to England last September. It was devastating to have to move out of Edinburgh to Sheffield, England last year for my husband graduate school. We will have to live here until summer 2014. I can only speak from my own experience attempting to settle as a spouse of a UK Citizen. I have personally found the level of bureaucracy in the UK makes the possible feel impossible. I didn’t know anyone in New Zealand before I went. Sometimes I forget the amount of courage it took me to get on the plane and just go. It was shockingly easy to relocate to New Zealand literally a few weeks after I made the decision. My visa to get into New Zealand took two weeks to be approved and within two weeks of my plane landing in New Zealand I had a job and place to live. Although I was married in January 2012 in the UK, my marriage visa was not approved by the UK Border Agency until September 2012. During this time, I was not allowed to work, study, collect benefits or even leave because they had both my passport and my husband’s passport. I am currently on a visa in the UK called an Extension to Stay as the Spouse of a UK Citizen. This visa will expire in September 2014. We are deciding now if we should go through another round of visas for me to stay in the UK or if we want to try living somewhere else in the world. We are seriously considering moving back to New Zealand next year. This is one the main reasons I decided to go ahead and publish Getting Rooted in New Zealand. Due to my visa restrictions with the UK Border Agency, I've had no rights to work in the UK, but they couldn't stop me from publishing my book. MRJ: What are things that inspire you or lessons you got regarding the cultural diversity around the world and what finally triggers you to write about your experience in the book "Getting Rooted in New Zealand". JB: Reading my book would be similar to receiving emails from a friend living abroad. My truth tends to be stranger than fiction, but it is really too weird to be made up. I had good, bad and weird experiences in New Zealand and California. Although I hope that I have learned from my mistakes, I wouldn’t change anything. My experiences have turned me into a writer and I am extremely grateful for that. That being said, I would like to go back to New Zealand and give it another try as a writer. MRJ: Before you finally set your feet on NZ, did you ever read travel books? If yes, what's your favourite? JB: I had a 12 month visa, but I literally had no plans. I skimmed Lonely Planet before I went, but knew if I thought about it too much I would lose the courage to go. It was shockingly easy to relocate to New Zealand literally a few weeks after I made the decision. It only took a couple of weeks for my work visa to go through. I was 26, single, I quit my job, I moved out of a little cottage I was renting and put the few things I had at my mom’s house and brought a suitcase with me to New Zealand. If things aren’t working out for you at home with relationships, instead of staying at home crying that you’re single, consider yourself free. You are free to do whatever you want. MRJ: Speaking of literary, any reads from local authors when you're abroad? Tell me about it and how do you like it? JB: I was lucky to meet a lot of talented people in New Zealand including the authors Cyan Corwine and Thomas Sainsbury. Cyan Corwine is sincerely the nicest person in the world and gives the best hugs. Thomas Sainsbury is very fascinating, funny and eccentric. May I Ask You Something? by Cyan Corwine is beautifully written and illustrated and absolutely inspirational. MRJ: Where else you want to go and write about? And why? JB: I had a chance to go to Australia and absolutely fell in love at first sight. We went to Brisbane, Sydney and Melbourne. I would jump at a chance to go to move to Australia. Jamie Baywood grew up in Petaluma, California. In 2010, she made the most impulsive decision of her life by moving to New Zealand. 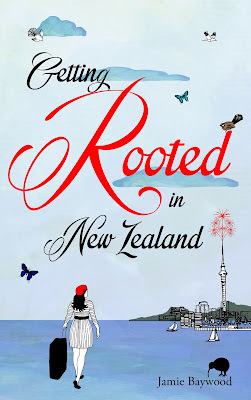 Getting Rooted in New Zealand is her first book about her experiences living there. Jamie is now married and living happily ever after in the United Kingdom. She is working on her second book. Read 'Getting Rooted in New Zealand'. Available on Paperback and ebook, order at Amazon.com. Click here. Contact Jamie Baywood on Twitter @jamiebaywood or Pinterest... or her Goodreads profile. COMING SOON: My First Giveaway!